This mug is inspired by Shelly Hail's thru hiking odyssey on the Appalachian Trail. 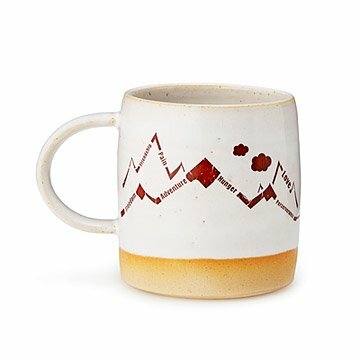 Inspired by Shelly Hail's thru-hiking odyssey on the Appalachian Trail, this generously sized mug sports a mountain range motif and words that invoke the ups and downs of the journey. Crafted by Hail and fellow potter Chris Hudson, it also features the A.T. symbol on the back, hiking boot tracks inside, and a lug sole-like texture on the bottom for a true trekker's tribute. It makes a great gift for anyone who enjoys campfire coffee or the allure of the trail less traveled. Handmade in La Motte, Vermont. Chris Hudson has been part of the ceramics world for over 16 years. She spent the first decade of her ceramics life in England, where she received her masters from the Royal College of Art in London. She has exhibited her ceramics in Norway, Denmark, the UK, and the US. Shelly Hail started her ceramics journey in Montreal. She throws, and does all the glazing and surface decoration. She is also an avid animal advocate, photographer, and cat lover. Quality mug, graphics clear and legible, loved the boot prints on the inside bottom of the mug; looked better in person than on screen/online Arrived in a timely manner, packed with care so it wouldn't break. Would reccomend this mug and would purchase from company again. Thank you Uncommon Goods. Great to display in our open cabinetry in the kitchen. Mug was for s friend who likes to hike and wants to do AT. My fiance recently got into drinking hot tea at work, but only had 1 mug which was a little small and would sometimes boil over in the microwave. He is also an avid mountain biker. Even tho this mug is labeled "Hiker" it could be for anyone who loves being outdoors. I bought this as a Valentine's Day present and he loves it. It's large and heats the water evenly when he microwaves it. Plus he loves the design on the outside and the bottom has an extra layer so it doesn't heat up the surface underneath it too bad. All in all, an excellent mug and great purchase. My husband love it. We hiked through portions of the Appalachian trail and this was a great reminder of that time. I had this sent to her (I'm in Indiana, she's in Virginia) and she let me know that she loved it! She has hiked over 1/2 of the Appalachian Trail so far and I thought it was the perfect gift. Good size and pretty colors. I like everything about this mug except it's size. It's really too large for one cup of hot coffee, too bulky for packing on weekend outings, too heavy for 10-year-old grandson to use comfortably. Really more like a soup mug when winter rolls around. But it is as advertized in every other way - attractive, dishwasher friendly, durable.